Certified Health Coach, Mom, Firefighter Wife, living with Hashimoto's, and helping people live as fit, healthy, and organic as possible. Currently trying new work outs and lifestyle changes to share tips and tricks for a healthier you! Please check my Facebook, Instagram, and Pinterest to stay up to date on Organish Living! I had to muster up a ton of courage and take a DEEP breath before I posted the picture below. Never, and I mean NEVER, could I imagine sharing this with the world BUT I want to share that what I am doing, what I am passionate about, has made real changes to my body and my health. After the birth of my children I was diagnosed with Hashimoto Thyroiditis, and struggled with low energy, and an inability to lose weight. I could work out everyday and still not lose a pound. When I finally decided to give the 21 Day Fix and Shakeology a try I didn’t have any expectations but knew I had nothing to lose. The result was a 6 lb weight loss in 21 days and more energy than I have had in years!!! Fast forward 6 months…. I ate poorly through the holidays and really failed with my workouts, gaining some of my weight back. So, in February, I decided to be “all-in” again and am so happy that I did! These “before” photos were taken on 2/22/15 and the “after” photos on 3/15/15. In that short time I lost 4lbs and 5 inches! As of last week I have lost an additional 3 lbs, for a total of 7 lbs in two months! I was able to accomplish this doing daily 30 minute workouts, drinking Shakeology, and eating clean foods, all with an amazing group of people to help keep me accountable along the way. My journey is just beginning and I want to share it with others looking to improve their overall health! The workouts are 30 minutes, family friendly meal plans are provided and ACCOUNTABILITY, motivation and support are all a part of the program! Send me a message or comment below and I can reach out to and we can talk about finding a program that works for you! Hello and Happy Friday!!! By this time next week I will have turned another year older (sigh) so today I’m going to make this post about my birthday wish list. Micah and I are trying to live by Dave Ramsey’s advice to get out of debt, most of which is student loan, so we won’t be spending any money on gifts for each other this year …BUT if I were to get anything for my birthday these items would be on my wish list. I have been eyeing this for…ohhhh…probably a year or so and have dragged my feet on the purchase. Well now that I am doing so many different types of exercise I know this would be perfect and it is at the very top of my wish list! 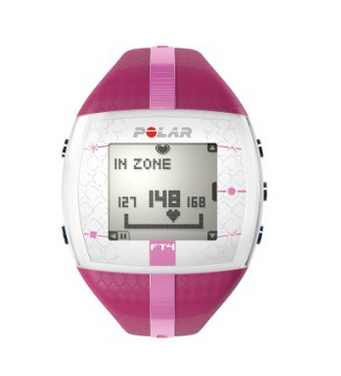 To use the Polar Heart Rate Monitor you wear a heart rate monitor band around your chest and it calculates your heart rate and calories burned. I think it would be amazing to see what different workouts accomplish. I’m willing to bet I would be surprised. Last year I decided I wanted to become a wannabe runner and completed a few 5K’s and began running around 4 miles a few times per week. This year I have decided to tackle a 10K. I know that is small potatoes for a lot of people but it is a HUGE goal for me and something I never dreamed I would ever even think about. I’m the girl who couldn’t even run a quarter mile a couple years ago, seriously! Now that I’m thinking I’m big time, it’s also time for some big time shoes. I’ve heard great things about Brooks running shoes and am very interested to see if they are a good fit for me. My mom asked me what she could get me for my birthday and my immediate response was a gift certificate to Runners Alley where they actually fit you for shoes. 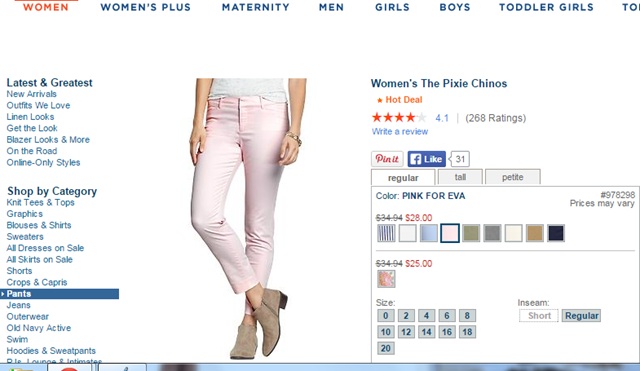 I’m hoping to get the best shoes for my body type….and probably buy two pair! One of my guilty pleasures is when packages arrive at my doorstep. I get giddy with excitement to see what I received, and half the time it’s just food I order on Amazon! But the truth is I love to shop and as a busy mom I hardly get out to the stores anymore, never mind to look for leisurely items like beauty products! What better fun than to have random beauty samples sent to your doorstep every month with Birchbox ??? Yes, please! I’m in BIG time need of new workout attire but especially some crop pants. I have a few Lululemon items but no crops and I hear nothing but rave reviews of the Wunder Under Crop II and would love to own a pair and see what all the hype is about. I’ve lost a good pant size, maybe even two, so all of my clothes are a little baggy. Thankfully I saved some nice full length work pants and can fit into those now but won’t have much for Spring. I love these pants and want them in every color! What’s an item on your wish list?! 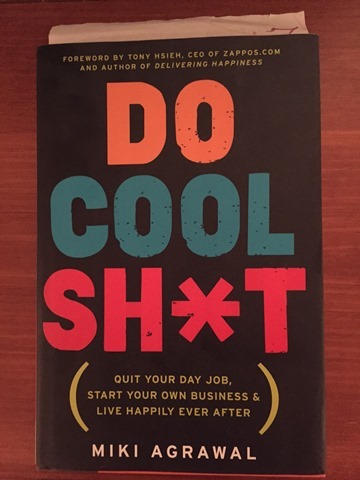 I’ve recently started doing a LOT of personal development reading and listening and am almost through the book Do Cool Shi*t by Miki Agrawal. Call it a quarter life crisis, identity crisis, whatever you will but over the last year or so I’ve found myself wondering what I want to do with the rest of my life. Realistically, I have another 35 years to work (that’s more years than I’ve been alive!) at minimum before I can think about retiring. In 2013 I received my health coach certification from the Institute for Integrative Nutrition and felt I found my passion but I’ve had a hard time figuring out how to make that work into my life. With two small children and student loan debt that feels like it will never go away, I’m certainly not at a place in my life where I can just start over. But I’ve been searching for a way to blend a hobby career of my passion for health and fitness into my current life. I’ve thought, and talked, about how to do it it but had not actually done anything with it. Then in October 2014, while at an HR conference, I listened to a speaker who reaffirmed for me that I need to be pursuing my passion. You’ve probably guessed it by now but that speaker was Miki Agrawal! She is a real person, around my age, who set some high goals and has reached them! She was an investment banker on Wall Street, a professional soccer player, founder of a gluten free, farm to table pizza restaurant in NYC, and is a partner in the company THINX. The inspiration behind THINX will blow you away, I strongly encourage you to check out the website www.shethinx.com to properly understand the concept of the brand. It’s a way to change periods for all women! Miki has figured out what she is good at, what she is not good at, how to set goals and how to get things done. Oh and the best part – she is just a cool person, definitely someone I could see myself being friends with…obvi! Through this book she walks you through exercises to figure out the same things about yourself. It’s insightful and realistic to what you need to do to make it in business. She doesn’t know it but listening to her speak truly ignited something in me and I’ve been evaluating every aspect of my life every day since. Thanks Miki! If you have any desire to do what truly inspires you and gets you out of bed every.single.day. read this book! I promise you will not be disappointed! What personal development book do you love?! Before children, hiking was something my husband and I enjoyed doing on a regular basis. After children, hiking has become a trail walk or a short hike up a small mountain with two toddlers in tow. Saturday my husband and I celebrated our anniversary and decided that we would go hiking (without children) for the first time in 5 years! 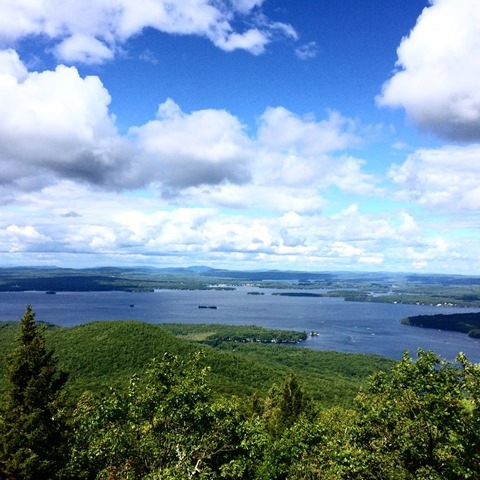 Most of the hikes we would have liked to tackle are a good hour or more drive from where we live so we settled on what I recall being a fairly easy hike, but something too intense to do with children. We chose to drive 40 minutes to Mt. Major located in Alton, NH. Both my husband and I have hiked this particular mountain many times in our life, and I remember it being fairly easy. Well this hike was proof that my hiking days are a thing of the past, I was huffing and puffing 5 minutes into it! I work out 5-6 days a week, run 2-3 miles on a regular basis, and consider myself in decent physical shape but this mountain decided to prove me otherwise. My husband couldn’t believe that I was sweating and having a hard time breathing as he was barely breaking a sweat. I tried to use the excuse that I was carrying the backpack with all the food and water, but let’s be serious, it didn’t weigh that much. Even though I was struggling to breathe I kept going with just a few stops for water, and to check out the blister that was developing on my heel. We reached the top quicker than I had anticipated (that’s a good thing, right?!) and the view was nothing short of beautiful. It was the perfect day for a hike and we enjoyed some trail mix overlooking the lake before descending down a different side of the mountain. As we made our way down the mountain we tried to remember how long of a hike Mt. Major is and were guessing that it was roughly a mile each way. I wear an activity tracking band (This is the one I wear) so we were hoping to be able to come close to what it would tell us at the end. Boy were we wrong! It turns out our hike took us 4.5 miles for a total of 8,840 steps. It made me feel a little better about my lack of hiking skills for the day 🙂 I am so glad my husband and I had the opportunity to get out and enjoy the day together, I look forward to doing it again. Hopefully next time it won’t be as major for me as it was this time! 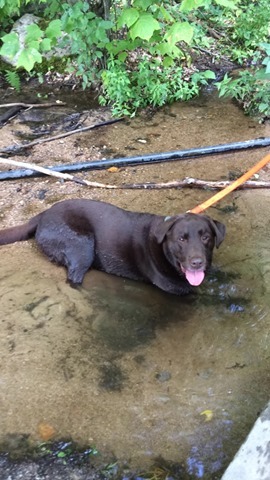 Our dog Grady had the right idea on how to cool down after a fun 4.5 miles!